Shimla is considered to be one of the most mind boggling and beautiful hill stations in India which plays a vital role in to getting away from the parching heat of summers. Having honeymoon in Shimla is really popular and hip since Shimla is a renowned holiday destination for families wanting to take their kids out in their summer vacations as well as for the honeymooners who seek for a special private place where nobody comes in the way of their happy romantic times. Honeymooners who are in love with photography and want to capture the unforgettable moments of their newly begun married life can always make a point to opt for the best Shimla honeymoon packages. The breathtaking view of Himalayas together with their snow blankets, the sight of expansive greenery consisting of Pine and Oak trees as well as the enthralling ancient buildings…all this together add an extra glitter to your Shimla honeymoon tours. In addition to this, the popular Summer Festival of Shimla allures honeymooners to a great extent, who after witnessing it turn their way towards a series of markets for shopping and therefore make their honeymoon tours Packages in shimla a fully memorable experience. Shimla hotel packages for honeymoon begin your honeymoon in India by turning your way towards the hilly regions consisting of the Summer Hill as well as the Elysium Hill. Summer hill is a bewitching spot on the Shimla-Kalka railway line where the honeymooners can hold their hands and can have soothing walks. Among the temples, Shimla has some of the most illustrious temples dotted over its landscape that certainly deserve a visit by you both. These include the Sankat Mochan Temple, Tara Devi Temple, the Jakhu Temple where Shri Hanuman resides amidst beautiful valleys, the Kaia Bari Mandir. In addition to these temples, there also exists the Christ’s Church of the mid 19th century that can be spotted over the Shimla Ridge. These religious spots are an important part of your Shimla honeymoon packages and honeymooners must make it a point to delve into them to pray for their prosperous married life. The sacred charm of these temples would at the same time purify your souls and infuse more and more love in your hearts. After exploring the above mentioned temples during your Shimla tour, you both can steer your way towards the hip and happening Mall Road from where you can shop and gift your sweetheart with awesome gifts for a good memory of honeymoon destinations in Shimla. And after the Mall Road visit of your Shimla holiday packages, you both can go and explore the Shimla forts that definitely act as real monumental spectacles for your sight to behold. The Akri Fort and the Kamru Fort are regarded as the prominent forts that are more than enough to enthrall your fancy just at the moment you both come closer to them. The striking location of the Kamru Forts let you both delve into it by nicely holding each other’s hands through numerous gates that are a part of it. Akri Fort, on the other hand is placed in the Solan District of Shimla, which also draws you both towards it. 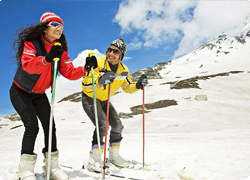 So, enjoy to the fullest all that your honeymoon tours in Shimla have in store for you. Accommodation for a couple for 2n/3days. Accommodation for a couple in specially designed honeymoon room . Hot kesar milk in the evening. Two bottles of mineral water. One Local sightseeing tour of Shimla. Surprise gift at the time of check out. Drop to Shimla railway/bus station.